"Thunder Hole" is a popular attraction along the Park Loop Road in Acadia National Park. Acadia National Park, Mount Desert Island and Bar Harbor have been grouped together since the 1900s, and when you travel to Maine for a weekend of hiking in Acadia, you will end up exploring what all three of these places have to offer. Think of it as a vacation with a bonus. The lay of the land is as follows: Acadia National Park is located on Mount Desert Island, which is a small (15 miles from the causeway to Bass Harbor Head) island off the coast of Downeast Maine. Bar Harbor is the island’s center of commerce, entertainment and nightlife. It is an upscale, resort style town that still maintains its integrity as a charming coastal community. Mount Desert Island and the development of Acadia National Park have a unique storyline. The artist Thomas Cole, a member of the Hudson River School, painted Mount Desert Island in the 1840s. After his work was displayed in New York City, wealthy urbanites began flocking to the island. This is the time in American history when wealthy industrialists and steel barons were establishing places like the Adirondacks and Newport, Rhode Island as their summer retreats. The Carnegies, Rockefellers, Astors and Vanderbilts all came to Mount Desert Island to rusticate. It became the de rigeur summer playground of the rich and famous. At that time, Bar Harbor was actually named Eden, and it was not renamed Bar Harbor until 1919. While this could easily devolve into a tale of American capitalism run amuck, or a classic example of how the super-rich commodify the coastline and destroy nature, it is not. Sure, the wealthy built massive seaside cottages and summer retreats, and tourism brought the construction of lavish inns and B&Bs, but more importantly, those wealthy industrialists created Acadia National Park. When Rockefeller, Boston textile heir George Dorr and others witnessed the island’s booming popularity, they began purchasing and protecting large parcels of land. 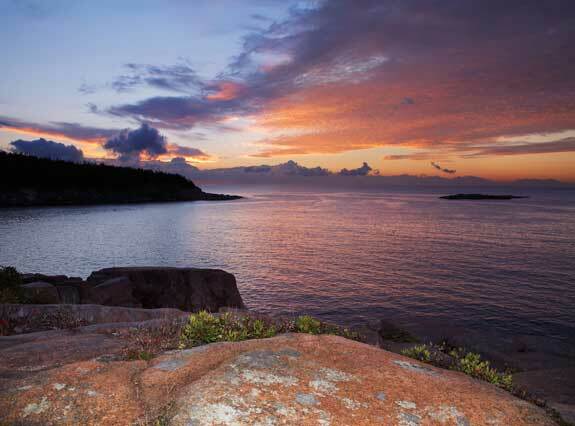 Rockefeller purchased 11,000 acres, which is nearly 1/3 of Acadia National Park. He is also solely responsible for the park’s carriage roads. All of the land was donated to the U.S. government, and Acadia opened to the public in 1919 as the first national park east of the Mississippi. 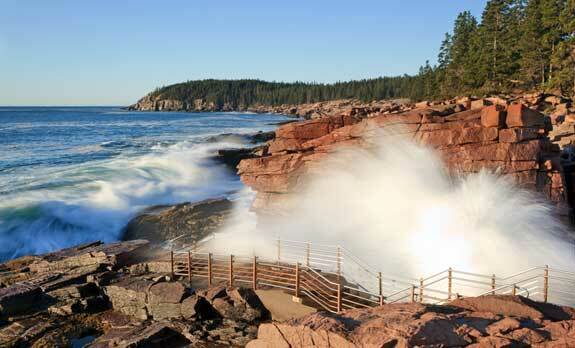 From May through October, the fee for Acadia National Park is $20 per car, and the pass is good for a week. The Park Loop Road is closed throughout the winter. In early spring or late fall, it is only $10 per car. From downtown Bar Harbor, you can also take the Acadia National Park Tour. It last 2.5 hours, costs $25 and stops at several highlights on the loop including Thunder Hole, Cadillac Mountain and Sieur De Monts Springs. While Acadia is composed of 57 miles of carriage roads and 120 miles of hiking and horse trails, the centerpiece of the park is the Loop Road. This spectacular roadway climbs up steep ridges and then winds through towering spruce trees, balsam firs and dark granite ledges, a panoramic ocean vista appearing around every corner. There are scenic pull-offs at intervals throughout the loop, but chances are you will be so wowed by the view that you will miss them the first time around. That is fine: just circle back around and do it again, and this time stop at all the highlights. Here is a look at what you will find on the Park Loop Road. The Precipice is Acadia’s most dramatic hiking trail. It is only a short hike to the summit, but the sheer rock face is scattered with iron rungs and ladders, which make for a challenging climb. The Beehive is another short but difficult trail. It overlooks Sand Beach. Crowded throughout the summer, Sand Beach is the only sandy beach on Mount Desert Island. Sand Beach is a picturesque crescent that sits between the arms of a rocky cove. Thunder Hole is an ocean side cavern. The surf crashes into the cavern, compresses and bursts out, creating a booming sound. Of course, Thunder Hole only thunders when the surf is right. Otter Cliffs are a set of 100-foot tall precipices. There is a footpath that traverses the crags. From the top of the cliffs it is not unusual to see whales spouting in the Atlantic. Located on the southern tip of the Schoodic Peninsula, Schoodic Point Park has some of the most unique granite ledges and rock formations in the park. The shoreline is veined with dark basalt, and it creates a stunning contrast with the white surf and steel-blue sea. No vacation to Acadia is complete without a trip up Cadillac Mountain. At over 1500 feet, it is the highest peak on the Atlantic between Canada and Brazil.